baierlboys: Is Anyone Maning the Store? We have 3 families on our block that have kids. 2 of us actually watch them. I am amazed that 5 year old kids are running around for HOURS and mom and dad have no idea where they are or who they are with. 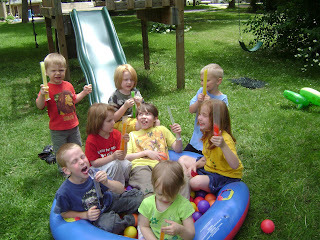 Below is a picture of only some of the neighborhood kids. Notice, I gave them something to eat. Well, today it happened. What Tara (the other responsible mom) and I have been saying for months. Some day "that kid" is going to get really hurt. I heard the ambulance come this afternoon and I thought for sure Evan was hit by a car. I have yelled at him a few times and his sister too to "GET OUT OF THE STREET!" He doesn't even look! Evan does not live on our street but a block over and he is allowed to ride his bike, with training wheels,all the way over to us. His parents have never met me, nor do they know anything about me. 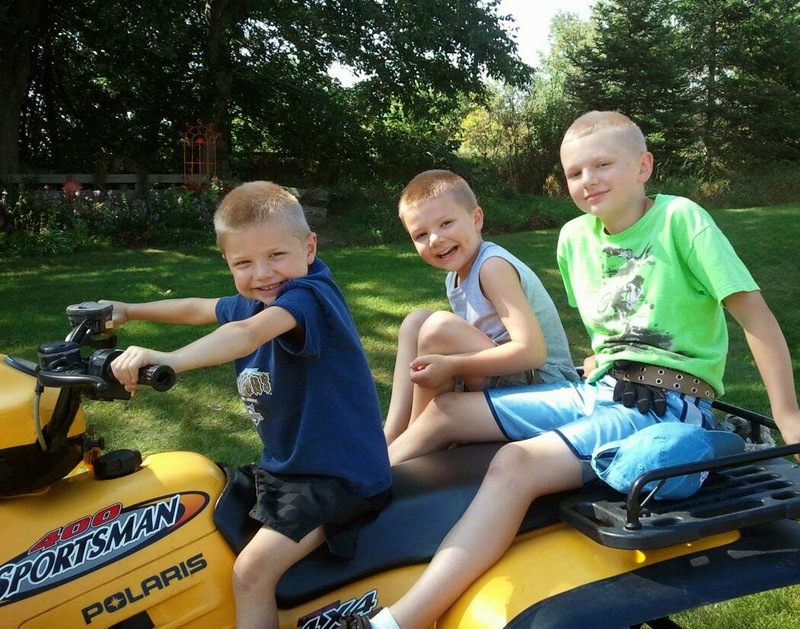 I could literally take Evan and his sister for a "ride" and they would never be seen again. Mom and Dad would not know. SCARY!!!!!! Well he did not get hit by a car - just a falling brick. That's right folks. The house that doesn't watch has a tree fort. You guessed it - some of the older kids were on the fort stacking old landscaping bricks into a tower and knocking down to the ground - can you imagine?! Guess what? Evan walked right under it and SLAM right on his head. Blood everywhere. Neither the mom of the house nor the mom of the kid were watching. It takes a neighbor boy to get him some help. Kid was taken to ER with neck brace and on a stretcher. So David says to me. OH BOY! I guess that is why you don't let me play in their backyard. UMM YUP that is why. (well that is one of MANY reasons) Like their middle child jumping from the 2nd story window "pretending to be Superman"
Well, let's just say he was no Man of Steel. More like Boy on Pavement. Lucky the kid lived. GEEZ! We had a prayer time for Evan as the ambulance drove off. 'Was a great learning experience for my WIDE EYED Caleb ( Mr. No Fear) and my very concerned David.